​(Goofin' Records) 4-Track EP - Picture sleeve, 45 rpm, large inner hole allows jukebox use! 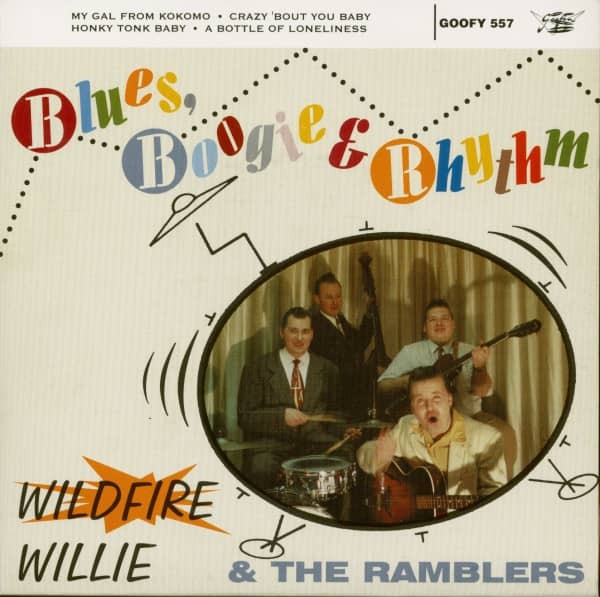 Legendary EP from the heyday of Wildfire Willie in the mid-90s! Started in 1985 by brothers Jyrki JJ (Guitar) and Markku (Drums) Juvonen. In late 1986 Jan (Vocals) joined the band as a singer and since 2003 the bassplayer is Carl Viktor. It was in Eskilstuna Sweden when the idea of the band was born when Mika asked us in October 1985 if we (Jyrki, Markku, Mika, Petri) could form a new band. 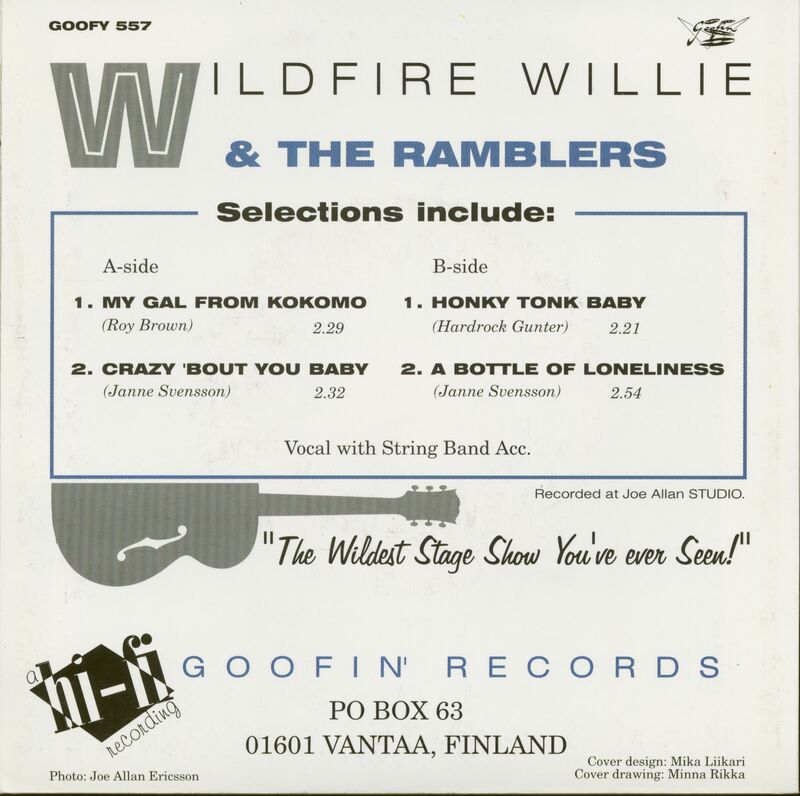 At that time Mika and Petri did have a Rockabilly trio which they quit in order to start this new band, "Wildfire Willie and The Wild Youth"
So in the first week of January 1986 Wildfire Willie had it’s first rehearsal. This new band, Wildfire Willie, took over all of the Wild Youths gigs they already had booked, so the first gigs were under the name Wildfire Willie and The Wild Youth. 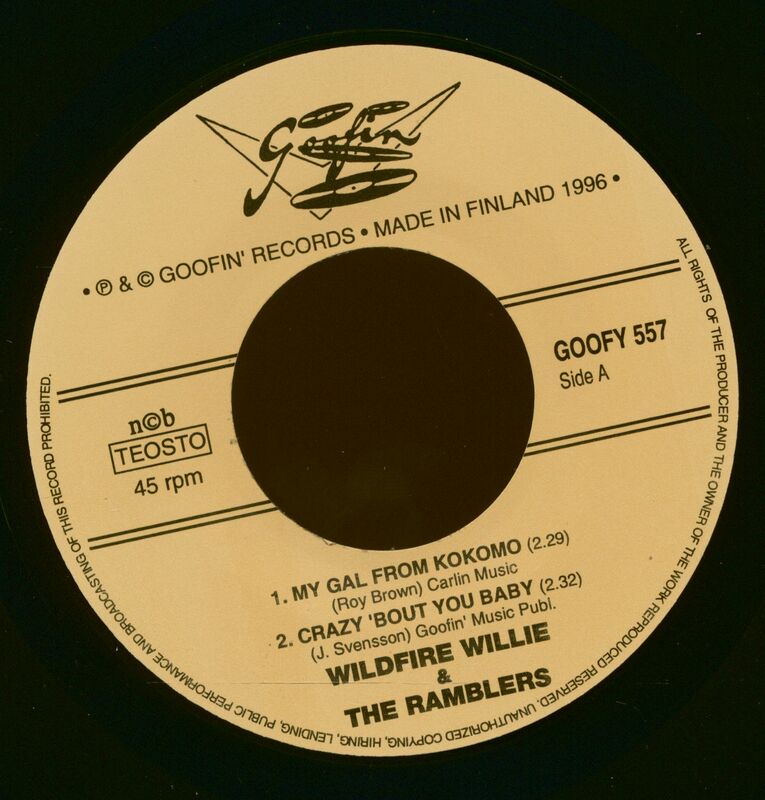 Mika came up with the name "Wildfire Willie" and later Markku came up with the name "The Ramblers". Petri left the band In the summer 1986 and only concentrated on his work as an electrician, so for a while Mika did all the singing before it was decided to search for new singer to replace Petri so Jan Swampson (from Jan Swampson and his Thermosar) joined The Ramblers in late 1986, after Mika quit the band in the early 90's, The Ramblers went through a succession of bass players but since 2003 Carl Viktor has been playing the bass. Wildfire Willie has now at present only its two remaining original members, Jyrki (Lead Guitar) and Markku (Drums). 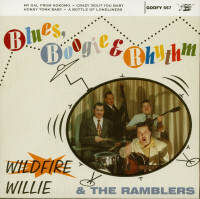 Wildfire Willie and The Ramblers has performed on differnt events such as in pubs, night clubs and festivals like the Hemsby RocknRoll Weekender and Rockabilly Rave in UK, Viva Las Vegas, Rockin 50s Fest (Green Bay), Denver RocknRhythm Festival in USA, Wintersun Festival in Australia, RocknRoll Jamboree in Finland, in Sweden the Live & Jive festival and The Hultsfred festival (biggest music event in Sweden) etc. It also has many different appearences on radio and TV shows. The band has been doin gigs and touring in many different European countrys and even in the former Soviet Union, Japan, Australia and of course many times in the USA. Recordings have been made for several different labels in Europe (Wildcat, Sunjay, Tessy Records, Lenox, Be Be's Records, Goofin' and Tail). The band has been playing as a backing band for many artists, both on recordings (Huelyn Duvall, Rayburn Anthony, Alvis Wayne and Bobby Crown) and on live performances (Billy Lee Riley, Jack Earls, Rudy Tutti Grayzell, Dale Hawkins, Alvis Wayne, Sleepy LaBeef, Hayden Thompson, Al Ferrier, Teddy Redell, Ray Campi, Johnny Legend, Huelyn Duvall, Art Adams, Rayburn Anthony, Bobby Crown, Glen Glenn, Mack Self, Johnny Powers, Carl Mann, Royce Porter). Customer evaluation for "Blues, Boogie & Rhythm (7inch, EP, 45rpm, PS, BC)"